If you are planning to start your career as a developer or you just want to improve your programming skills, then this course is right for you. Learn how to build amazing portfolio website you can share with your colleagues or future employers. Get all you need to start web development in one course! Start with technologies of Web Development to more advanced topics until your application will be deployed to Heroku and accessible online on the internet. This resource is the only thing you need in order to start Web Development with Next.js , React and Node. During this course you will get confidence and skills required to start your own projects, you will get the right mindset to apply for a developer career and to improve in modern frameworks like Next.js , React.js and Node. We will start with short introduction of Next.js framework. We will follow starter introduction guide on Next.js website with my additional explanation and examples. I will explain to you benefits of server side rendered applications and I will get you familiar with Next Framework. Furthermore, we will work on a base layout of our portfolio application, we will create first pages and base styling. Later in this course, we will take a look on authentication with Auth0 on the client/server side. Users will be able to authenticate with google or other social provider. Next, we will work both on the server and the client and will implement base portfolio functionality. We will create CRUD (create, read, update, delete) API. You will learn how to use forms in react and you will get familiar with popular Formik package. After portfolio section you will be challenged with Slate framework. We will start working on Blog feature. I will show you how to create blog editor similar to Medium. We will create functionality to save and update portfolios. Then we will create blogs dashboard page for users to manage their created blogs. Clients will be able to publish and delete blogs. All of the published blogs will be able to read by everyone on our website. Next, we will work on UX improvements of our website. You will learn how to create simple animations and how to make better user experience. You will get more familiar with CSS. Then we will get into SEO ( Search Engine Optimisation ). You will learn basics of SEO. We will provide to our website more semantic informations and we will make page improvements, so our portfolio website will be even more amazing and more competitive on the web. In the last section we will start preparing our application for deployment. We will do production and performance improvements. Later in this section will deploy our applications to Heroku. Our portfolio will be fully accessible on the internet by anyone. During this course we will be switching from our frontend application to our backend Node application. This Node application will be responsible for handling and storing our business data in MongoDB. Starting as well as experienced developers interested in modern frameworks as Next, React and Node. Taking this course will enable you explain before difficult concepts to your fellow colleagues in simple way. This course teaches you Swift 4 and iOS 11 basics by building a beautiful custom camera, which is a crucial component in modern mobile apps. Swift 4 and iOS 11 are shipped with the game-changing Core Machine Learning (Core ML) SDK which allows developers to build "smart" apps. So far, pre-trained Core ML models typically require visual inputs such as photos and videos. As such, building a beautiful custom camera to visually capture the world is the first, and crucial, step towards building such intelligent apps. You'll master this task in this series. 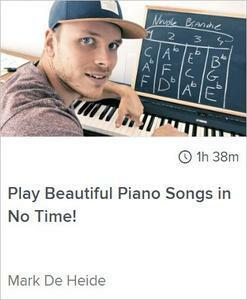 Play Beautiful Piano Songs in No Time!